Lumia 535 which was launched Last November by Microsoft without the brand name Nokia for Rs 9,200. 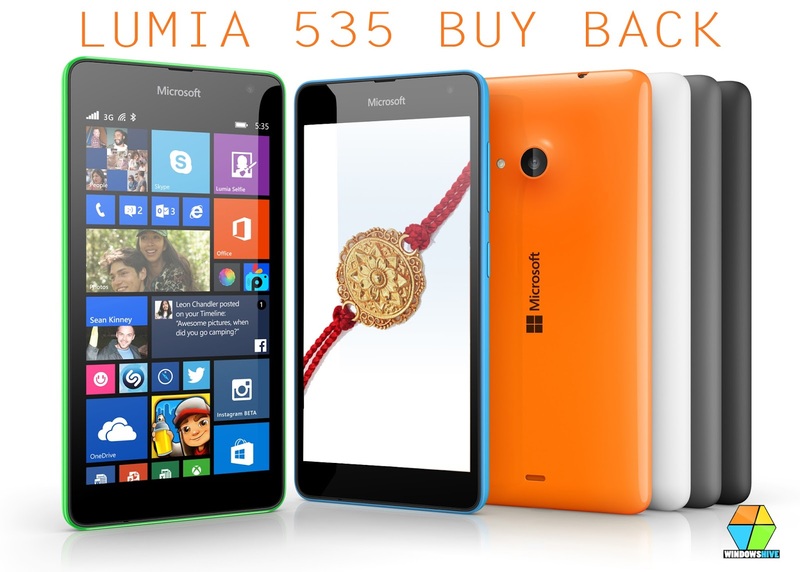 On this occasion of Rakhi, Microsoft has introduced the "Smart Buy Back" offer on Lumia 535 with the price tag of Rs 5,999 only. This offer is valid from 13th of August. Lumia 535 (black version) is been sold for Rs 6,918 on Flipkart, which means Microsoft will only give you only Rs900 for your old Smartphone. Lumia 535 Features a 5 Inch IPS LCD display, qHD resolution, Coated with Corning Gorrila Glass 3. It is powered by 1.2GHz Snapdragon Quad Core Processor with 1GB Ram and is a budget smartphone that comes with the latest version of Windows Phone 8.1. Specially designed for Selfie generation, it comes with 5mp secondary camera, that let's you take clear selfies wherever you go.The lumia 535 also comes with the Lumia Selfie app. The Lumia 535 comes with up to 8 GB of internal memory which can be expanded up to 128 GB through a MicroSD card slot. You also get up to 15GB of free OneDrive cloud storage. This phone has a 1905 mAh battery which gives you up to 11 and 13 hours of talk time on 2G and 3G networks respectively.